What is your name? My name is Jesse Fresco, but I have a facebook page called HARD Corps Bloodshot. I’m most well known for Bloodshot. As far as I know, I’m one of maybe two or three other people that has done that character, and the only one that has done the character at a convention. 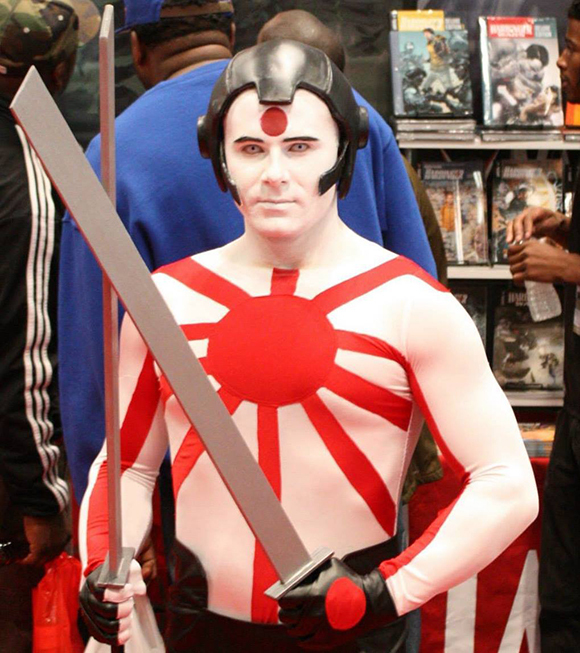 My favorite character design is of course Bloodshot, though I did enjoying doing Rai last year at NYCC 2014. That has a similar look but is much more complicated due to the Rising Sun flag on the chest. I didn’t know how to sew before cosplay and I still don’t. I don’t have the time these days to learn either. My job overrides most things these days. My techniques has improved over the years simply through learning more about the make application process and becoming more patient with it. I use different brands of make up than when I start so it works much better and longer. For Bloodshot, it takes around 90 minutes to two hours for my make up time. It’s a long process and can be frustrating at times. Rai takes about an hour to do since I don’t have to paint my hairline. 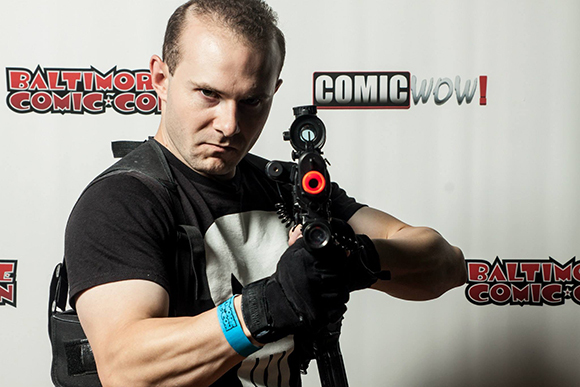 The Punisher is my easy costume since it’s really just a t-shirt, black pants, and some prop guns. Since I don’t sew, I can’t say that there is a pattern that really aggravates me but I do have a story about doing Rai at NYCC 2014. I had some cosplay friend from Action Packed Cosplay help make the outfit but I only got to put it all on once I got to New York so I had no time to try it out. When I finally got the pants and the shirt on, I realized that the shirt would ride up and the pants would fall down. They outfit had to be skin tight so it was really tough to get on and take off. So I had to be safety pinned all the way around the waist line in order for it to work. I couldn’t sit down all day. I doubt I’ll do Rai again until I get a much more efficient way of doing it. In terms of celebrities artist and writers that I’ve met, I’ve met pretty much everyone at Valiant and they know me pretty well. They give me passes to shows and let me hang out at the office if I’m in New York. I’ve also kept in touch with many of the writers and artists online and we chat every now and again. I’ve been chatting with Joshua Dysart lately about our love of Mad Max Fury Road. He’s a cool cat. I almost met Kevin VanHook, the creator of Bloodshot, at SDCC 2014, but he had to head out early and I missed him. I saw him from afar though. I’ve chatted with him online though. He’s also a cool cat. 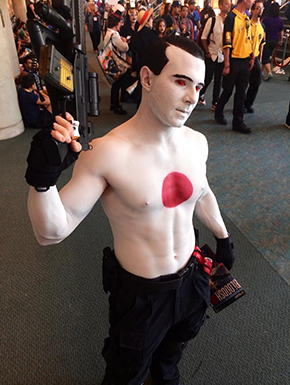 The funniest thing that happened to me at a convention is really what happens at most conventions; people’s reaction to my appearance as Bloodshot. 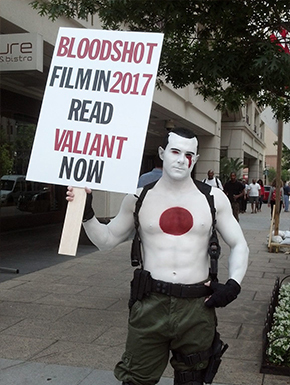 Valiant gave me a pass to go to San Diego on the condition that I bulked up and went as shirtless Bloodshot. I pulled it off and got to go! I met Adrienne Curry, Tera Patrick, Jenny Lorenzo, Chloe Dykstra, Sam Witwer, Comicbookgirl19, Jamie Bamber. Everyone was shocked when they saw my appearance. I really stood out. Comicbokgirl19 drew a sketch of me as Bloodshot and I gave her copies of some of the Bloodshot books because there’s a character that looks just like her. In terms of things outside of conventions, when I started working out full time in November 2013, I went back to the gym I used to work at when I was in high school. 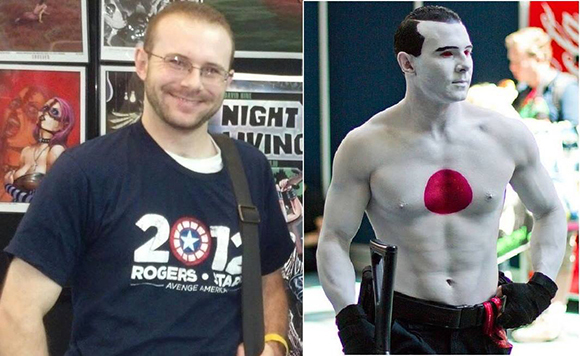 I started doing personal training with a guy named Matt, and he really pushed me to become the character Bloodshot. I got really bulked up after a few months, and after my workout one day, I was sitting up at the front desk just talking with Matt and the owner Pat Mullarkey, and I mentioned that Valiant really loved my dedication to becoming the character. Matt then said, “I think my uncle works for Valiant.” I turned my head and said, “What’s his name?” He said, “Hunter.” It turned out that Matt’s uncle was Hunter Gorinson, director of marketing and communications and digital media at Valiant! What are the odds of that happening? When I asked Hunter about it, he said that he used to live in Crofton, Maryland years ago, which is where I lived years ago as a kid. He could have been my neighbor and I never knew it. My best memory of cosplaying was the look on Dinesh Shamdasani’s face when I first saw him at SDCC 2014. Dinesh is the CEO of Valiant, and also a cool cat. When I got to San Diego and I was heading to his condo to pick up my badge for the first day of the show, I walked up the stairs to his living room and he was there with Hunter, and I believe Fred Pierce if I remember right. Fred was the Publisher of the original 90’s Valiant and still is today. When I walked in the room, Dinesh’s jaw hit the floor. I swore that I would become the character and look just like him, and I did just that. To make him happy was a great feeling. I do read comics though my time has been very limited these days. My job has become my life since I just started training to be a full time personal trainer at my gym. I read all the Valiant titles, as well as Crossed, Judge Dredd, Ms Marvel, Escape From New York, Robocop, Punisher, War Stories, and Red One. I also have a pile of trades that I still need to read. Currently, I really love Divinity from Valiant, which is essentially 2001 A Space Odyssey in the Valiant Universe. Ms Marvel is also pretty great as well, one of the best female characters in comics right now, if ever. It’s one of the few Marvel titles I still read. My favorite comic book character is a tie between Bloodshot and The Punisher. The Punisher is what got me back into comics full time after I read Ennis’ run on Punisher MAX. My inspirations are cosplayers like Alpha Furyan (who makes me look like a slacker at the gym), Jessie Pridemore, Ani-Mia (who is a friend of mine that I don’t get to see often enough these days), Miss Sinister, and many others. Oh, and Henry Rollins. Everybody needs to be inspired by Henry Rollins.Have you ever participated in any cosplay events or costumed fund raisers? I have not participated in any cosplay themed events or fundraisers yet simply because I don’t have any characters that could be considered “family friendly”, plus I don’t have the time. I’m on a very tight schedule these days. Personal hobbies for me include working out, comic books, watching films (I was a film major in college and worked in the business for seven years), and when I get the time, video games, though that’s become an almost non-existent hobby for me now. I just don’t have the time to dedicate to games too much anymore. My Xbox 360 mainly collects dust these days. For anybody wanting to get into cosplay, just take note: when you start out, you are going to f*** up. Your first outfit will probably not be very good and it will barely hold together. But don’t stop doing it. Keep at it and learn the craft over time. Nobody nails it right out the gate. Do it because it’s fun, not because you want to win a contest. Can you tell us what new costumes you’ll be working on for the future? As for new costumes, one that I’ve been wanting to try is Ninjak, another Valiant character. Imagine if James Bond was a ninja. That’s Ninjak. That will be tough to do since it’s a lot of sewing so I’ll have to learn that eventually. I’ll get it done at some point though. People can interact with me on my facebook page at HARD Corp Bloodshot. I have a personal account but I mainly reserve that for friends.